The British Gazette » Brexit: Achieving the Impossible? In his latest typically well argued and most authoritative blog-post entitled, Brexit: “This is simply impossible”, (http://eureferendum.com/blogview.aspx?blogno=86590), Doctor Richard North chose an excellent title for the piece. This of course begs this question: Can the impossible be achieved? Logically, there can only be one answer to this question: No. That is because if it were possible to achieve the impossible, then the impossible would no longer be impossible but possible, which would mean that the so-called impossible wasn’t impossible but possible. Again, logic would suggest that what Dr. North fears is barring some unforeseen event coming about, likely to come to fruition with all the dreadful consequences. A similar very well argued counsel of despair (https://peterjnorth.blogspot.co.uk/2017/08/a-downfall-we-deserve.html) comes from Pete North’s Politics Blog today. Given this, it would seem that a reasonable statement to make would be that those who are in government and those who as civil servants are implementing the will of their political masters without advising their masters of the negative consequences of same are either fools, OR if some of them are secretly scheming to make a fortune by exploiting the turmoil of the commodity, currency and stock markets following a crash Brexit, guilty of the most gigantic and monstrous fraud. So, this brings us to another question: Could it be that our leaders are neither fools or fraudsters but instead of being either of these two nouns starting with the sixth letter of the alphabet, are in fact gamblers, a noun starting with the seventh letter of the alphabet? This brings us to the relevance of the images above. Last night on BBC2’s “Newsnight”, the presenter, Emily Maitlis interviewed a most unfortunate fellow who was an addictive gambler. His addition had cost him dear, which included estrangement from his loved ones and a spell in prison. 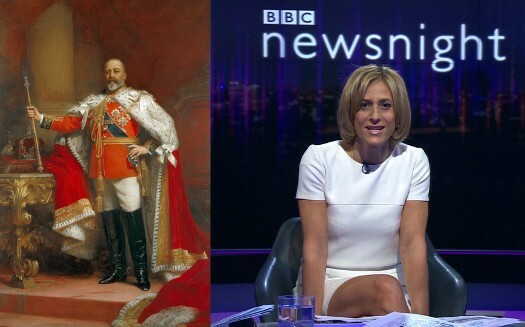 A person Emily Maitlis would find it impossible to interview would be HM King Edward VII. For the obvious reason that he died on 6th May 1910! This sound advice may well have been lost on the ears of British ministers. Could it be that the Tories are playing a game of “ultra” high stakes poker? There has been discussion – including on the web pages of the EU Referendum blog – about the possibility of the UK remaining in the EEA after a no deal Brexit. At the present time, the UK government has stated that the UK is a member of the EEA by dint of it’s membership of the EU and that when Brexit takes place, the UK will therefore leave the EEA at the same time. There are others who are of a different opinion. They state that in order to leave the EEA the UK must formerly give one year’s notice and if it does not, then it will not have left. So here we can find ourselves asking another question: If – hypothetically – the ministers, civil servants and legal advisers were of the understanding that the UK would remain an EEA member after Brexit and would have to formerly leave same, then why are they suggesting the contrary? The answer would have to be: Politics. Of course, IF this is the case the government’s legal advisers are giving their legal OPINION. Any actions based on this opinion would inevitably be tested. In the courts. They continue with their present strategy. The clock ticks. Time is running out! Then someone – Gina Miller perhaps? – petitions the High Court to adjudicate on whether the UK will find itself outside the EEA upon Brexit automatically OR that a year’s notice has to be served and as such requires a vote in Parliament? Clearly such litigation – and were such litigation to result in a judgement that parliamentary approval WAS required – the proceedings (both judicial and parliamentary) would have to be concluded BEFORE Thursday 29th March 2018! Therefore, now let us suppose that such as Gina Miller initiates legal proceedings and as last time, the Supreme Court gives it’s decision: That to leave the EEA the government must formerly give notice AND such notice – requires parliamentary approval. Clearly, there is but one course of action for the government: To submit a bill to the House of Commons – the European Economic Area (Withdrawal) Bill. Should this bill FAIL to become law then the government would be unable to serve notice to quit the EEA and thus the UK would be members of the EEA AFTER Brexit. Now of course, this could happen either by sufficient numbers of “Remainer” MPs voting with the opposition OR the House of Lords blocking the bill – were this to happen after Saturday 29th September 2018 – the government could not use the Parliament Act to force it’s will through for EEA withdrawal to take effect before Brexit. Now, were the Tory government to FAIL to get the European Economic Area (Withdrawal) Bill the UK would then be in the EEA post Brexit but also outside EFTA. Because the UK would not be in EFTA it presumably would not be subject to the EFTA court. One can imagine that on the basis that an agreement takes two or more parties to agree to it for it to work, the EU’s complaisance would be at the price of the UK having to submit itself to the jurisdiction of the ECJ! For the Tory government, it would be politically important for them to be able to heap the blame for all of this upon the opposition! Could therefore another question be asked? Could this whole business be a great charade? A gigantic coup de théâtre? There is one thing we can be certain of: We are living in interesting times!